Norway’s prime minister has dismissed calls for an end to further offshore oil and gas exploration in her country, after nearly 200 countries signed a historic deal on Saturday to push for zero net emissions in the second half of the century. “We’re going to continue with oil and gas,” Erna Solberg said on Sunday, in comments echoed both by her Progress Party coalition partners and the Labour Party opposition. Norwegian environmentalists on Saturday and Sunday called for a dramatic halt to new oil and gas activity in the wake of the Paris agreement. “Parliament should cancel the entire 23rd licensing round and stop exploration for new oil and gas resources on the Norwegian shelf,” the Green Party MP and spokesman Rasmus Hansson declared in a call that was backed by the country’s Socialist Left Party. Trine Skei Grande, leader of the minority Liberal Party said that the Paris deal should push Norway to shelve plans to open up the picturesque Lofoten islands to exploration, a prospect which has generated strong opposition in the country. "The goal of limiting the temperature rise to 1.5 degrees means that all Norway's plans for oil and gas need to be revised," she told Norway's Dagbladet tabloid. Opening up new fields in Lofoten and Vesterålen for the extraction of oil and gas would be luring the industry to make investments that will never pay off." “One of the first thing we must do is to cancel oil drilling in the Arctic,” said Lars Haltbrekken from the Norwegian Society for the Conservation of Nature. “There is absolutely no room for Norwegian oil from the Barents Sea or Norwegian gas much beyond 2040 in a 1.5C scenario,” Truls Gulowsen, from Greenpeace Norway said. 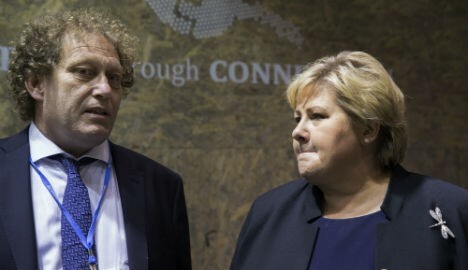 Jonas Gahr Støre, the leader of Norway’s Labour Party backed Solberg’s call for the upcoming licensing round to go ahead, arguing that the natural gas Norway supplies to Europe was helping to reduce carbon emissions by cutting consumption of coal.